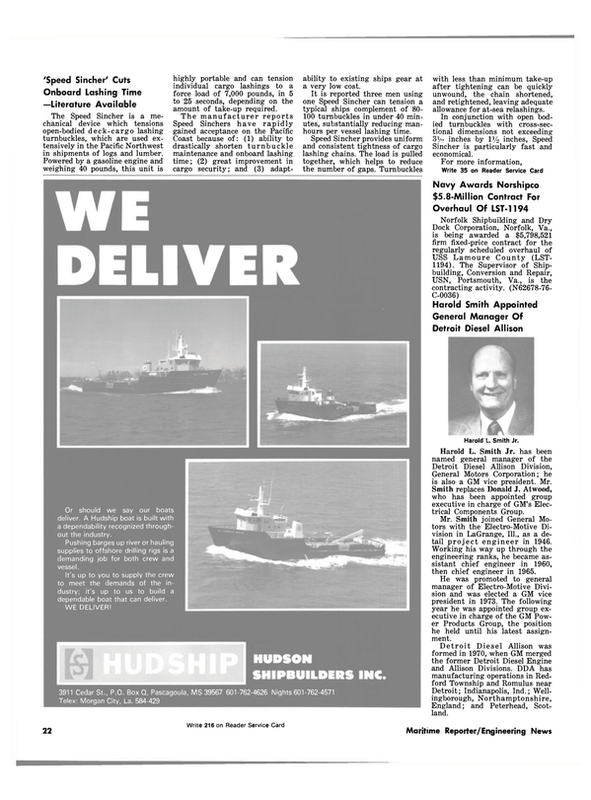 The Naval Sea Systems Command has awarded a contract valued at $690,000 for five 50-foot utility boats to Uniflite, Inc., fiberglass boat manufacturer headquartered in Bellingham, Wash, according to James J. Doud Jr., president. These utility craft are used as support vessels on aircraft carriers, accommodating up to 146 personnel or 24,000 pounds of cargo, for runs between the carrier and other vessels or shore stations. They are 50 feet 2 inches LOA, 15-foot beam, and each is powered with a single Detroit Diesel 6-71N engine rated at 174 bhp. The fiberglass 50-footers will be built in the company's Bellingham yard. Delivery is to be made within 12 months with three going to Norfolk, Va., and two to San Diego. Uniflite has been the largest supplier of fiberglass boats to the U.S. Navy over the past two decades, and is also a leading manufacturer of an extensive line of commercial vessels including special- purpose patrol boats, excursion boats, research boats, workboats, and c o m m e r c i a l f i s h i ng craft up to 66 feet. The company also has an Eastern plant at Swansboro, N.C., on the Intracoastal Waterway.